This string quartet is quite straightforward and pleasant to play. It is by Joseph Boulogne, aka Chevalier St George , who was born in 1739 in Guadaloupe - at that time a French colony – and died in 1799 in France. His father was a former French parliamentary councillor and his mother a black woman from Guadaloupe. He started having violin lessons before moving to Paris aged 10, where his life changed dramatically. He took part in a wide range of activities including riding, swimming, dancing, skating and fencing, excelling in the last and becoming a master swordsman. By his early twenties he was performing his first two violin concertos, opus 2. He had a successful musical career as conductor, violinist and composer, though his colour barred him from the top jobs and prevented him from ever marrying. He later had a military career, then went to Saint Domingue to support a slave rebellion there. When he returned to France in 1797, he tried to resume his musical career but sadly was unsuccessful and, 2 years later, died a pauper. His compositions include operas, symphonies, violin concertos, 12 string quartets and several other chamber works. 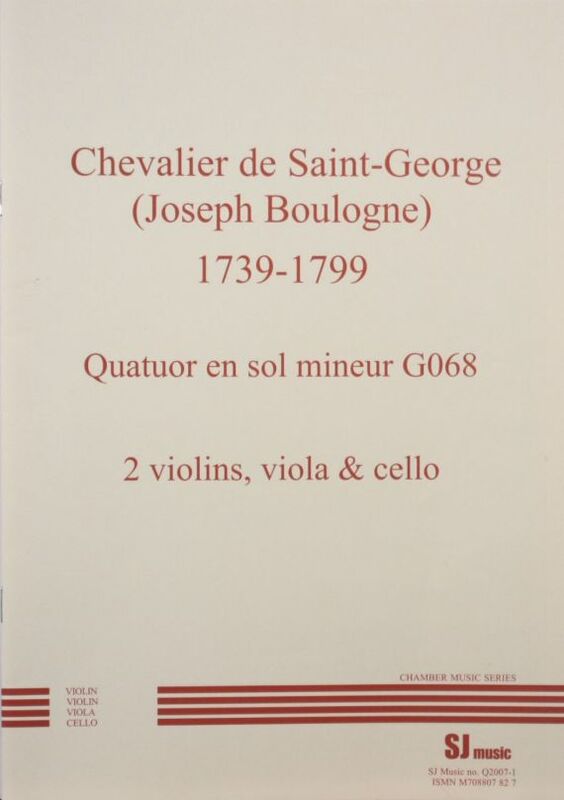 The Association 'Le Concert de Monsieur de Saint-George' was founded in 2000 to rehabilitate the reputation of this remarkable man. This edition of his quartet opus 68, from the second set of six written in 1777, is derived from a copy kindly made available by the Association. Some phrasing and dynamics are suggested by the publisher.